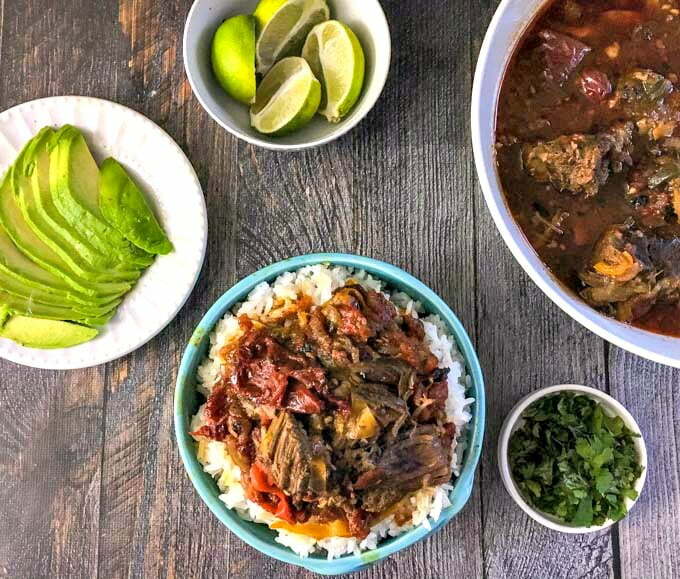 This spicy barbacoa beef roast was a snap in the Instant Pot. 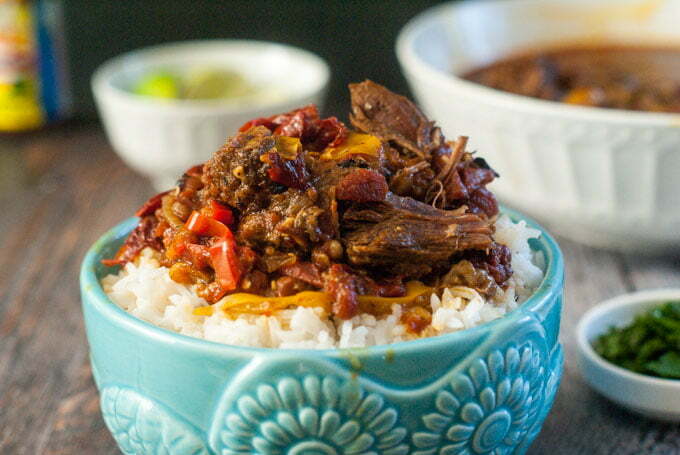 Full of spicy goodness, it’s perfect over rice for a delicious beef dinner. And you can make it in a slow cooker too! You might also like this low carb Instant Pot balsamic beef recipe! Sometimes we get in the mood for a spicy dinner. Often I’ll make an Indian curry for me and my husband but my son doesn’t really like them. So today I took a shot at a spicy barbacoa beef roast in my Instant Pot. My thought was that Max could eat a quesadilla with a little of the spicy beef and surprisingly he did! I might have to make him try that Indian curry again. Anyway, this was so good with rice, avocado, cilantro and a squeeze of lime. You can eat it many different ways too like in a burrito or salad. What I know about Barbacoa beef is what I get at Chipotle to be honest. Looking it up it seems that it’s been adapted from different regions and now the mainstream term is a spicy and tender piece of meat often with onions and cilantro. Learn more about the origins of Barbacoa here. 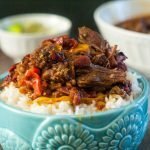 For me I’m using the term to describe this spicy shredded beef which you can use in tacos or rice bowls, much like at Chipotle. I didn’t have enough time to make it in a slow cooker so it takes roughly an hour in the Instant Pot. You can brown the meat and saute the veggies first and then pressure cook all in the same pot. It keeps it warm until you eat it. NOTE: By the way, it takes awhile for the Instant Pot to come up to pressure so when a recipe says it cooks for 40 minutes, it’s more like an hour. Whenever I’m using the Instant Pot I count on having at least an hour before dinner which is really not too long. As I’ve mentioned, this is very spicy. As in I used a lot of spices and rubbed them all over the meat. Then I browned the roast in the Instant Pot to seal in the juices and set it aside. Lastly I sauteed some onions and peppers before putting all the ingredients in the pressure cooker along with the meat and let it cook for 40 minutes or so. NOTE: The meat will be tender at 40 minutes but not fall apart tender. If you like it to fall apart, cook it for 50 minutes in the pressure cooker. 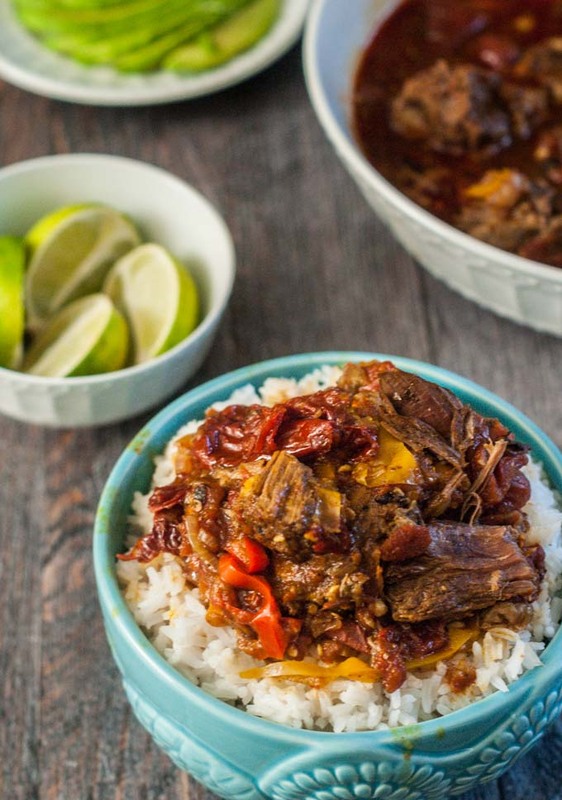 You can make this spicy Barbacoa beef in the slow cooker too. Just rub the spices on the meat, brown on both sides in a hot skillet with a little oil. Then add everything to the slow cooker and cook on low all day. We ate this over rice with a little avocado, cilantro and squeeze of lime. ( I meant to put the lime in the recipe but forgot and I found out it wasn’t necessary). You can also eat this in a burrito, quesadilla or even on top of a salad for a lower carb dinner. As I said it is spicy. To cut down on the heat, eliminate the jalapeño but we like it hot. I hope you enjoy this super tasty beef as much as we did. 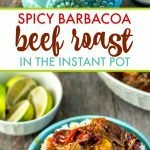 This spicy barbacoa beef roast was a snap in the Instant pot. 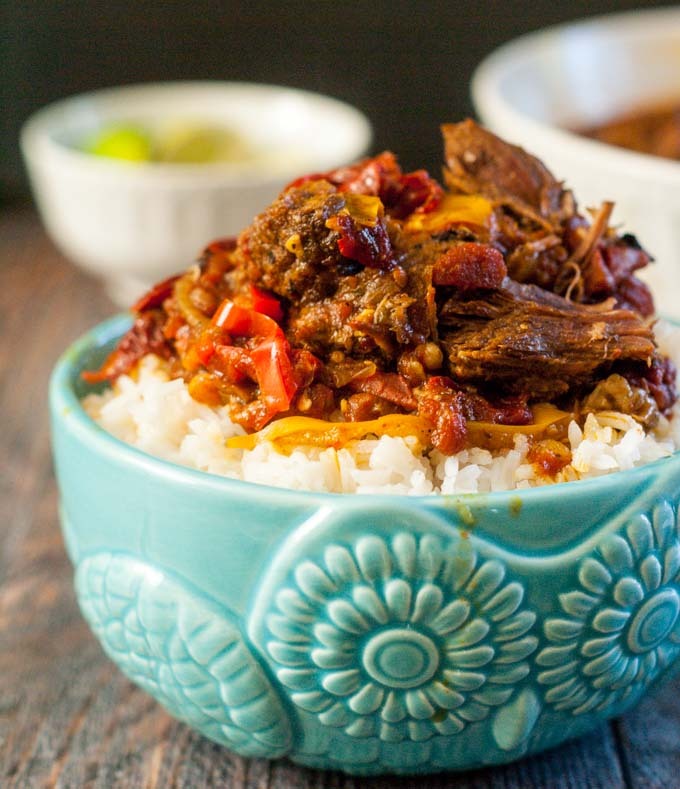 Full of spicy goodness, it's perfect over rice for a delicious beef dinner. Push the saute button on the Instant Pot and adjust to put it on high. Mix all the spices together in a small bowl and then rub all over the roast. Add 1 tablespoon of oil in the pot and brown the meat on both sides. About 3 minutes each side. Take out the meat and add the other tablespoon of oil and saute the onions for 2 minutes. Add the rest of the ingredients, stir well and then place the roast on top. Place the lid on and seal. Push the vent knob to the back. Cancel the saute mode and then push the manual button for high pressure. Quick release or let come down from pressure naturally for more tender meat. Add a squeeze of lime, cilantro and avocado on top if you wish. Note: To make this in the slow cooker, rub the meat with the spices and then brown in a skillet for about 3 minutes on each side. Then place all the items in the slow cooker, mix and place the meat on top. Cook on low all day. If my roast is only 1 lb, do I need to adjust my time? I’m not sure to be honest, Andrea. I did find that it’s more about the thickness than the weight. Basically it’s 15 – 20 minutes per inch of meat. Hope that helps. And you can check out the link for other cooking times. Hi Aubrey. I have never heard of a caribou roast! How interesting. So glad you liked it and thank you for coming back and sharing your tips! I don’t have a can of Chipotle, what substitute do you recommend and how much liquid would you add extra. Hi Sarah, the chipotle just adds some spice and smokiness. You can try to use a can of chiles or eliminate it altogether. Or you can even try a fire roasted diced tomato instead of regular. I don’t think you need to add any additional liquid. There is not much in the chipotle peppers. Hope that helps! Hi Karrie, I hope you like it! I got an instapot for Christmas and it does not have a manual button. I press “pressure cook” and use the “+” button but it only goes to 4 then resets. Urgh…first time user and can’t find anything online, only info is for the ones with a manual feature. minutes that should work out fine. Hope that thelps! Something is not working correctly, Lynne. The Pressure Cook button has replaced the Manual button on the newer Instant Pots though they have the same function. After pressuring the Pressure Cook button, you should be able to press the + or – buttons to add or subtract time. If it is not working that way, call Instant Pot Support or email them to see if your IP is malfunctioning or perhaps you’re inadvertently doing something wrong. The Manual/Pressure Cook button is all I use. I simply press it and select the amount of cooking time I need. Is it possible to double the recipe? If so, how much extra time? 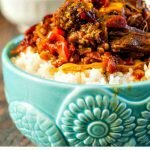 I have never tried it but according this article (https://www.hippressurecooking.com/how-to-double-a-pressure-cooker-recipe/ ) it says that you should keep the time the same, however it may take the pressure cooker longer to reach pressure. Also make sure you don’t fill it up to more than 2/3 of the pot. I just use the manual button on high pressure. I’ll add that the recipe! And do you have to drain it? I used a 14oz can of diced tomatoes and a 7oz can of chipotle peppers. I did not drain either. I have fixed the recipe. Thanks for bringing that to my attention!